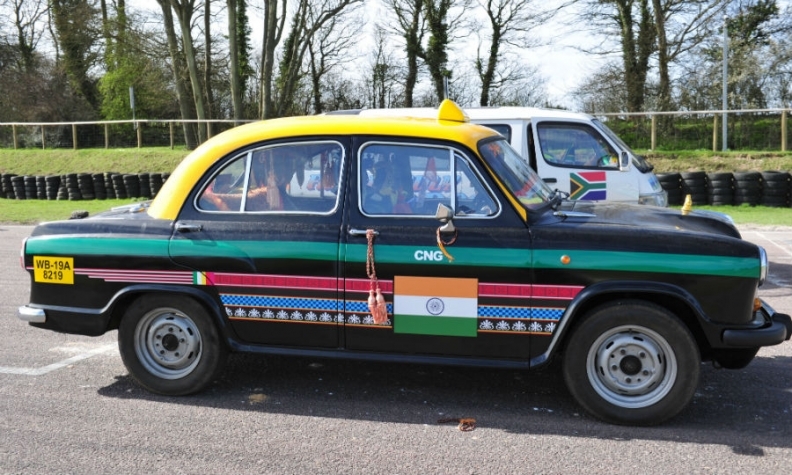 The Hindustan Ambassador was used as a taxi in India. PSA Group has bought the rights to the Ambassador nameplate as part of its plan to return to India's automotive market after a 20-year absence. The name could help the French automaker to win over India's car buyers who don't recognize the company's Peugeot brand. "You can imagine us adding this name for a brand for PSA, which is not so famous in India as the Ambassador is," a PSA spokesman told Automotive News Europe. PSA paid Hindustan Motors, part of the CK Birla Group, 800 million rupees [$12 million] for the name, a CK Birla spokesman told local media. The Hindustan Ambassador sedan is arguably India's most famous vehicle by dint of its impressively long production run from 1957 until 2014. The design of car, based on a Morris Oxford Series III, remained largely unchanged throughout its life. However, demand dwindled in its final years as buyers turned to smaller, more modern cars from automakers such as Suzuki and Hyundai. PSA has not disclosed any plans for potential Ambassador but reviving the name for a low-cost brand is one possibility, IHS principal analyst Ian Fletcher said. However, that might not be the correct decision. "We see with the success of the Renault Kwid in India that a low-cost vehicle can be a feeder to the rest of the brand," Fletcher said. "Building a brand presence may be more important than separating low-cost and more premium models." Renault sales increased 148 percent in India last year to 132,235 after the crossover-styled Kwid city car reached number eight in the vehicle charts, figures sourced by Australian based Bestsellingcarsblog.com show. PSA was one of the first foreign automakers to enter the Indian market in the 1990s, but left in 1997 following losses arising from factory disputes surrounding local production of the Peugeot 309 subcompact. It announced a return in 2011 with the construction of a 170,000-capacity factory in Gujarat state, but abandoned the plans the following year as it dealt with financial problems at home. In January PSA announced it had signed an agreement with the CK Birla to build cars and powertrains in India starting 2020. The joint venture will manufacture vehicles in India's south-eastern state of Tamil Nadu with a capacity of 100,000 vehicles a year, PSA said. PSA's return to India will be gradual, CEO Carlos Tavares told Reuters. Production will start around 10,000-15,000 units annually at a Hindustan Motors plant in Chennai, Tamil Nadu. PSA quoted analyst predictions that the India market would reach 8 million to 10 million cars by 2025 from the current 3 million in 2016.